Set of eight (8) bearings with integral flanged half-spacers. Breakthrough self-aligning design corrects for flaws in bearing seat levelness, bearing seat spacing, axle diameter and axle straightness. More than two years in development, Seismic Tekton™ bearings feature wide, flat contact surfaces at the ends of integrated, custom-machined half-spacers. The broad flanges square up, co-align and self-stabilize inside your wheels - correcting for flaws in bearing seat levelness, bearing seat spacing, axle diameter and axle straightness. The Tektons literally block themselves from sitting or rocking out of alignment, so they stay straighter than any other bearing system ever. 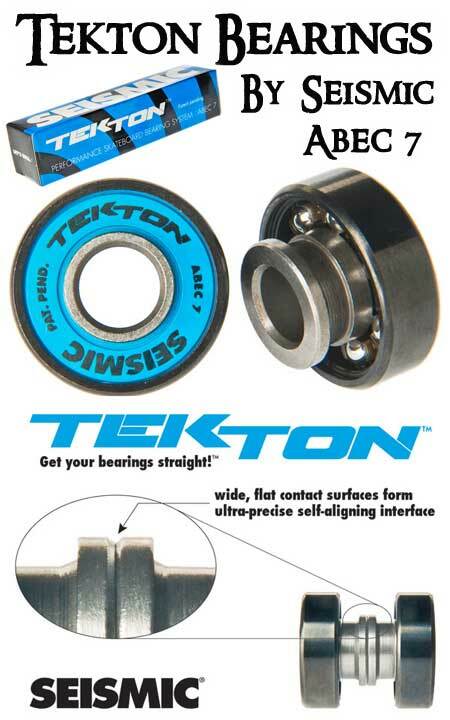 Your wheels roll faster with better control, while the bearings last longer and stay quieter. Other features include: ABEC-7 rating, steel balls, nylon retainers, black outer casing, removable rubber-coated steel seals with printed graphic, and a proprietary lubricant combining both oil and grease. The inner race is stepped underneath the seal to resist contamination, and it’s stepped between the bearing and the flange to save weight. On the side opposite the flange, the inner race extends 0.5mm to form a thin integrated washer. No bearing spacers, axle washers, or World Record budgets required!